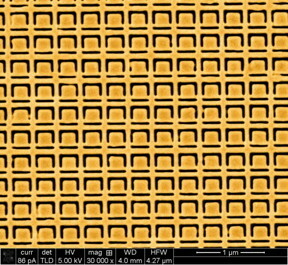 This gold metamaterial nanostructure is a nanoscale version of the structure described by the University of Southampton researchers in Applied Physics Letters, and it exhibits large specular optical activity for oblique incidence illumination with light (rather than specular optical activity for microwaves). Optical activity--rotation of the polarization of light--is well known to occur within materials that differ from their mirror image. But what happens if this symmetry is broken by the direction of illumination rather than the material itself?